“The Ramayana teaches the principles of Dharma and the path of duty to every individual. Though ages and aeons have passed by, the Ramayana remains ever-fresh guiding humanity on the path of truth and righteousness. Even today we think of the characters of Ramayana with respect and reverence. You can very well understand its greatness. There is no morality higher than what is depicted in the Ramayana. The Ramayana should be the subject of our Parayana (worship). 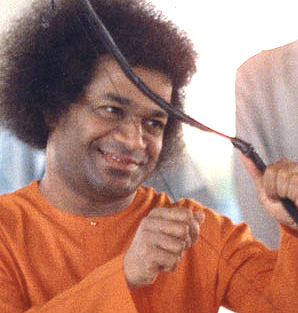 You should install the principle of Rama in your heart and experience bliss. Practise the teachings of Ramayana in your daily life. Obey the command of Lord Rama. It is to understand and assimilate the principle of Ramayana that we are celebrating the festival of Rama Navami today. It is not enough if the celebration is confined to merely partaking of sweet pudding and other delicious items. This year 1999 was something special. Mr. Subramania Chettiar attained the Lotus’ Feet of Bhagavan Baba on 13th April, 99. But it was a cherished dream and desire of Late Chettiar to install a temple for Lord Rama Pattabhishekam. Swami had given his blessings for this project, and Sri. Chettiar was not to live that day and witness his great ambition coming true. His illustrious and loving son, Sri Srinivasa Chettiar, had taken over the mantle of the President ship of the Padhya Trust. He strived very hard to realise the dream of his demised father. 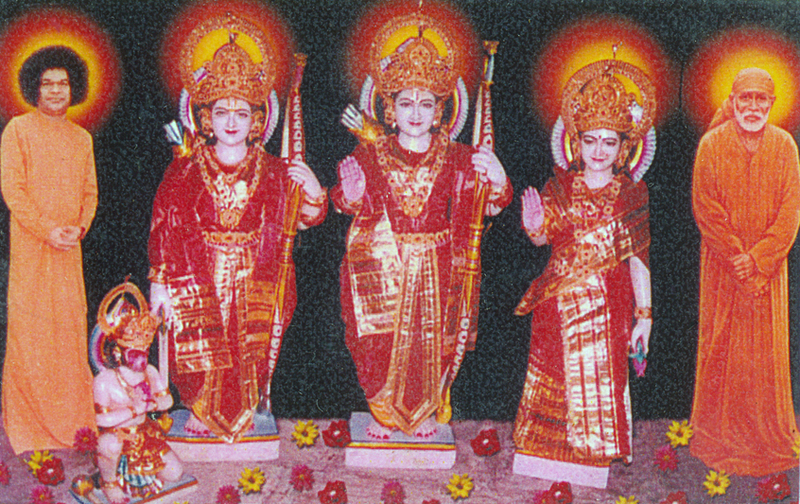 It was proposed to install the idols of Rama, Sita, Lakshmana and Hanuman. 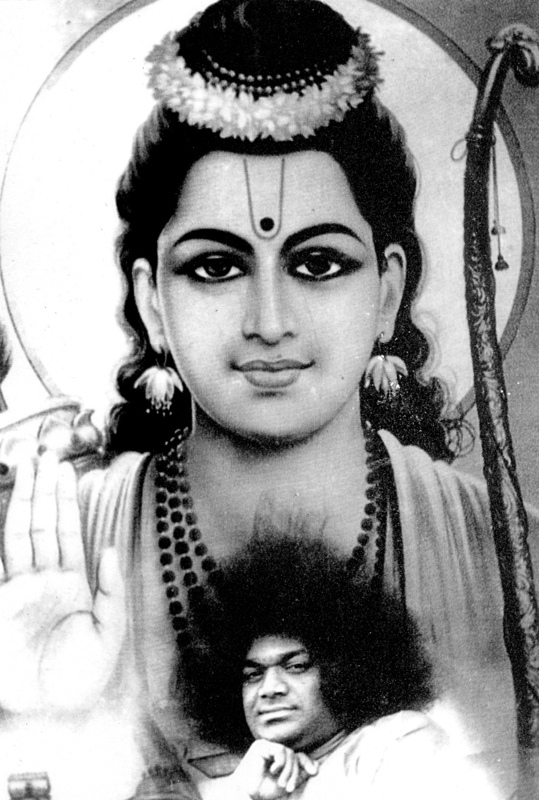 Rama’s idol was to be about 6 feet in height. But Swami felt that this will necessitate a temple with very tall Gopurams and hence advised to restrict the height of the idols to about 4 ½ feet only. The installation itself was shared with Divine suspense till be end. 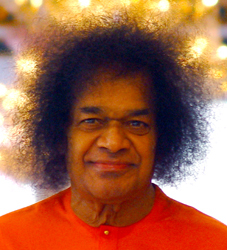 “Know and enjoy my uncertainty” is the dictum of Bhagavan Baba. True to this, the suspense prolonged till about a week of installation. Swami had promised that He Himself will select a suitable Site for construction of the temple for Lord Rama. The days and weeks passed on, and there was no message from Swami on the selection of Site. Bhagawan Baba directed Srinivasan Chettiar to go back to Madurai to look after other arrangements. Finally, though all arrangements had been completed, it was realised that it was practically impossible to build a temple within the available short time. A strong foundation, sturdy pillar, a concrete slab, and then a Gopuram are all to be erected. It was humanly impossible. Just about 10 days before the proposed event of installation, Swami told Srinivasan Chettiar that Swami had made a choise of place where the idols are to be installed. The choice of the site was a grand one, as is always with Divine Sankalpa. The newly extended area of the beautiful Sai Kulwant hall had encompassed the place where the 108 crores of Sri Rama had been inferred. Swami directed that a large Mandap be built in this site, suitable enough for the installation of Rama, Sita , Lakshmana and Hanuman. During installation ceremony, Bhagavan Baba created a small “Lingam” and directed Srinivasan Chettiar to insert the same in the small pit wherein the idol of Rama is to be installed. Swami mentioned that it is ‘Rama Lingam” which will attract devotees and activate Vibration inside Prashanthi Nilayam complex. The old Hanuman vighraham had also found a place in the same Mandap. 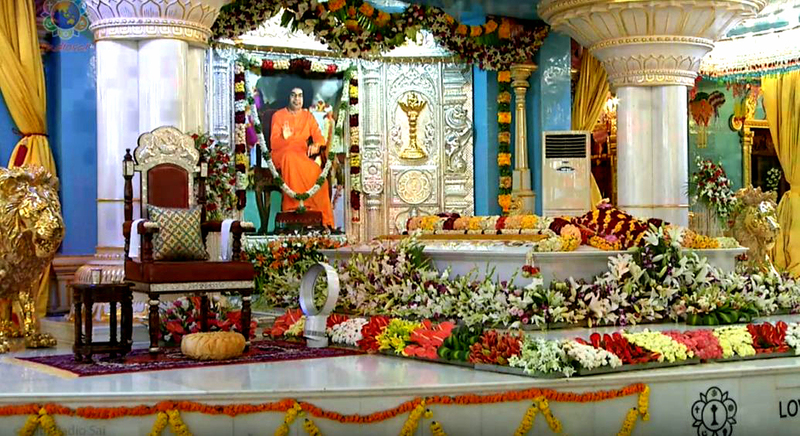 This entry was posted in Puttaparthi, Sai and tagged Sai Baba, Sai Rama, Sathya Sai Baba, SRI RAMA NAVAMI. Bookmark the permalink.